I Ended up with the equivalent of a FREE full TANK OF GAS by using Bitron Products, gas conditioner in my gas on a regular bases. The following chart shows the result of the round trip we made from Vancouver Island BC to Glengarry County Ontario between Mid May and Mid July 2000. On this trip we used Shell Bronze only. 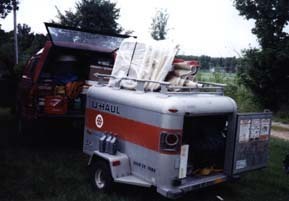 Most of the way east the truck was empty and on the way back west it was loaded and towing a loaded 4 x 6 U-Haul trailer with a rack, which was more than half full. The base rate for mileage I have used for these calculations is 23.38 mpg, when no bitron gas conditioner was being used. If a lower base rate for mpg was used, then the net benefits would be even better. The over all spread was from -2.64 % 23.73 mpg loaded to 45.6% 35.5 mpg empty. These calculations as presented in the following charts are subject to correction, if wrong. On This return trip with a loaded truck and loaded U-Haul we avaraged 26.26 mpg over a distance of 3140.7 miles driven on level 4 lane highways, 2 lanes, hilly, curvy roads, city traffic, slow highway traffic, some rain, our speed around 90 to 95 kms/hr. and just about everybody passing us. This 26.26 mpg average is 2.88 mpg above the base rate of 23.38mpg we had in stop and go traffic. 28.98mpg From Quesnel to Edmonton and east the truck was basically empty. 28.21mpg about 800km of this 1215.0 km was in stop and go traffic around Lancater, Ont. On This trip we avaraged 30.46 mpg over a distance of 3332.58 miles driven on level 4 lane highways, 2 lanes, hilly, curvy roads, city traffic, slow highway traffic, some rain, our speed around 95 to 100 kms/hr. and just about everybody passing us. This 30.46 mpg average is over 7.08 mpg above the base rate of 23.38mpg we had in stop and go traffic. 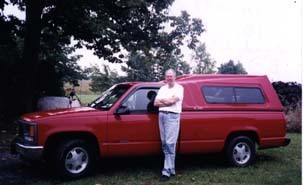 Over the past winter, since late October 1999, I estimate that for each 3 ounces of Bitron Gas Conditioner I use with a tank of gas in my 97 GMC 1/2 ton truck, that I get an extra benefit of 8 to 10 dollars, a 100 or so extra kilometers per tank of gas for stop and go driving. This is a 12 to 15% increase in gas mileage. Thus for each 12 ounce bottle of Bitron Gas Conditioner [ for 4 fill up of the gas tank] I use, I get an extra benefit of about 40 to 45 dollars, which is more than the equivalent of a half tank of gas saved. Thus the saving of at minimum a full tank of gas every 2nd month over the last 6 months is equivalent to over 100 dollars even when the cost of the products is taken into account. In addition to the Gas Conditioner, I use the Engine Formulation in the oil, 2.4.6 in the steering and rear end and tire sealant in my tires. Depending on the driving habits of the driver, the results you get will vary. The results I got since August of 1999 have spread from 10 to 12% to about 40% as a result of using these Birton Products. There is no doubt that these Bitron Products will work for you like they have for me. Your choice is to take that risk and see how they do work for you. my gas mileage as gone from 822.4 km on a tank of gas as of June 13, 1999 to 1135.7 km on a tank of gas as of Aug 5.1999, which is an increase of a little over 38% if my calculations are right. This has increased my miles per gallon from about 23.3 to 26.279 mpg. This is just a result of running around the area between Curry Hill, Lancaster and Cornwall. One round trip to Dalkeith & Maxville. This is stop and go driving no long trips, Probably the longest trip would have been 60 to 90 km, not steady driving, but stop & go. I know that as I use each new tank of gas the results will vary as far as what mileage I get goes. Using bitron gas conditioner along with the other bitron products has shown that a substantial increase in gas mileages can result. Where in the past, gas mileage averaged about 900 kms per tank of gas, it can now average in the range of around and even over 1100 + kms per tank of gas on daily running around with your vehicle. The results will differ for each user of bitron products. The above results are what I got over the past 2 months by doing just that, using bitron products in my vehicle. My truck now runs smoother, quieter, cleaner , better as a result. Have you checked your oil lately, what color is it on your oil dipstick , dark, black, grey or in between?? The color of my oil after at least 5100 kms since my last oil change is the colour of light to medium honey., basically just like new. The following chart shows the result of the log I kept from June to September 1999.